A fresh coat of deck stain can make on old deck look new, and can dramatically change the look of your backyard. 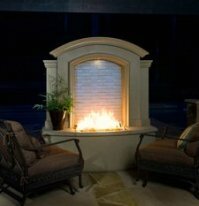 If your deck is looking a little "rough around the edges", this may be the simple solution for you. With a little time and effort, you can have that tired old deck looking great again. It's not hard to learn how to stain a deck. 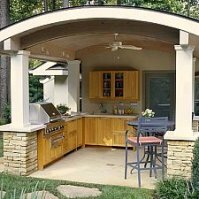 Of course, there are contractors in every area who will be happy to take care of the work for you at a reasonable cost. But keep reading and decide if this option is right for you, and if so, do you want to tackle it yourself or hire someone to do it for you? As is the case with all stain or paint projects, the secret to a good job is the preparation. You can cut corners, but the job will never turn out as well as it could have. If you're going to spend the money and make the effort, you may as well do it right. Before a deck stain can be applied, the deck must be clean. If your deck is new, you may not need extensive cleaning, but I do recommend waiting 4 to 6 weeks after installation to let the wood dry out a bit. Depending on the wood, this may not always be necessary, but better safe than sorry. On an older deck, there will be some cleaning needed. Applying deck stain on a dirty deck is a waste of time and money. The best way to clean a deck is with a pressure washer. If you have one or can borrow one, great - you're ahead of the game. If not, they can be rented, usually less than $50 for a half day, or around $75 for a full day. I would suggest a full day, just to keep you from having to rush. 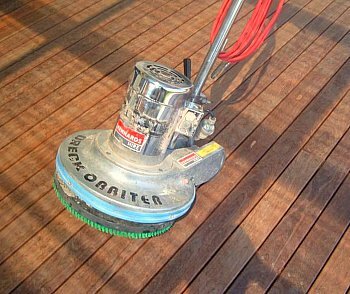 If your deck has been previously stained or painted, you will probably need a stripping agent in addition to the pressure washer. The solvent is readily available at hardware stores - just follow the directions on the can. There are those who discourage pressure washing a deck - and there are legitimate concerns. You must do it right or you can ruin your deck. Pressure washers with the right tip can etch concrete - so imagine what it can do to your wood deck. If your washer has an adjustable pressure setting (psi) start at about 600 psi and see how that works. You may find that a higher pressure works better, but work up to the right setting. Use a fan tip and start with the tip about 18 inches away from the deck. You will probably need to get closer than that, but you want to avoid getting too close with the pressure too high. Consider starting on a stair tread. If you really mess it up, they are easier to replace. Until you get the feel for your machine and your deck, take it slow. Take your time - be careful, and you should have no problems. Always clean in the direction of the wood grain, starting with the handrails, finishing with the deck surface. Long, smooth strokes are more effective than short, choppy movements. Your deck will look much better after washing, even before you apply the deck stain. This step is optional, but it can make a lot of difference. Plenty of decks have been stained without being sanded, and people are generally happy with the results. But that is usually because they haven't had a sanded deck to compare theirs to. The process of pressure washing leaves the wood with a fuzzy feeling surface, This is actuall the wood fibers that have seperated due to the washing. They will wear off in time, but sanding them will start you off with a nice smooth surface rather than waiting to grow into one. More importantly, sanding smoothes the naturally weathered wood surface and actually prepares it to better receive and absorb the deck stain. Your finished job will look good without sanding - it will look great if you sand it first. 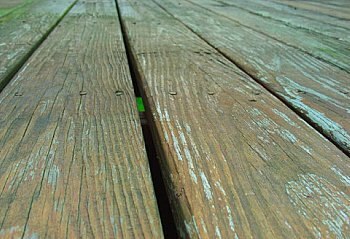 Before you begin sanding, be sure to inspect your deck for any protruding nails or screws. Set the nails and secure or replace the screws. Running a vibrating sander into a protruding nail head will get your attention, and it may damage you sander. I recommend sanding with an orbital sander using 80 grit sandpaper. (similar to the pictures) I guess you can rent or borrow a sander if you don't have one, but they aren't that expensive and they come in handy for a multitude of do it yourself projects. I'm a Dewalt man, but there are plenty of manufacturers. There's really no need to sand the wood completely smooth, after all, this is a deck - not a piece of furniture. Just smooth the rough edges and get rid of any splinters. Again, move the sander with the grain of the wood. There will be places you can't get the sander into, so you may need to do some hand sanding. Don't spend a lot of time on the places you can't see, like the underside of the rails. (actually, I wouldn't spend any time) The balusters and posts aren't as important either. Hit them lightly and move on. The more important areas are the deck boards and the handrails - the places you will feel. You should be able to walk barefoot on your deck without fear of injury! You are just looking for a fairly smooth and consistent surface on which to apply the deck stain. There are circumstances where a small handheld sander isn't practical. If your deck is very large, you may not be willing or able to spend that much time on your hands and knees. 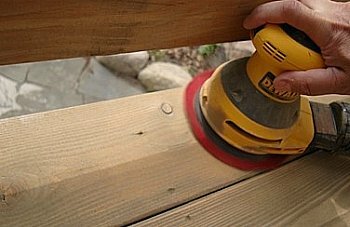 If your deck is in extremely bad shape, you may need to sand off more wood than is practical with a handheld sander. 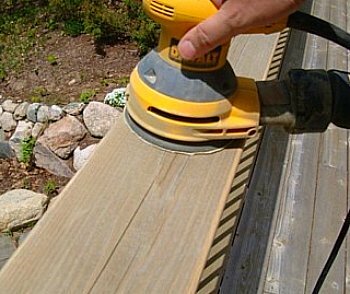 If you are adding a new section of deck onto an older section, you may need to sand a little deeper as well in order to get the two sections to more closely match. Weigh out the considerations and the workload and decide which option is best for you. If you need a larger sander, they are available for rental. Of course, you can once again hire a contractor to do this for you. Just remember, except for special circumstances, most decks can be adequately sanded lightly by hand. At this point you are almost ready to apply the deck stain! Once you are finished sanding you will need to clean the sawdust from the deck. 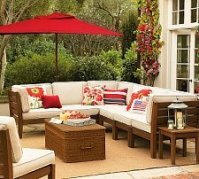 Deck stain will adhere to the sawdust rather than the deck surface if you do not remove it. Use a shop - vac if you have one available. An air nozzle and a compressor can also come in handy. A leaf blower works just as well. This doesn't have to leave the deck in perfectly clean condition. Again, this is a deck, not your interior hardwood floor. Just vacuum and / or blow the deck off and you will be ready to stain.